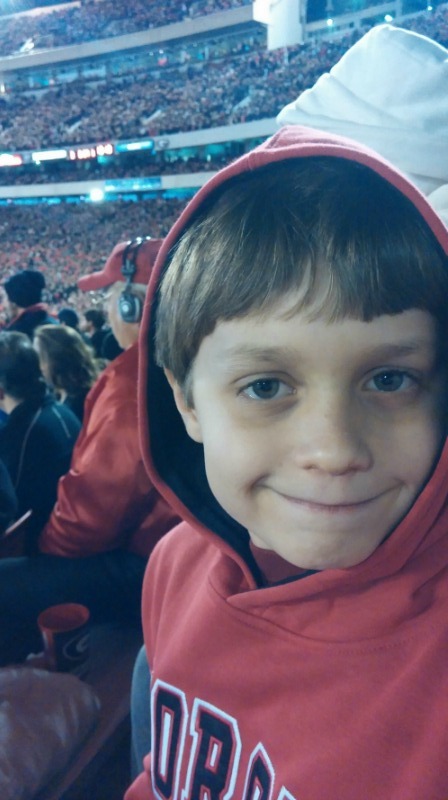 Seeing the look on your son’s face when he sees his first UGA home football game start … priceless. 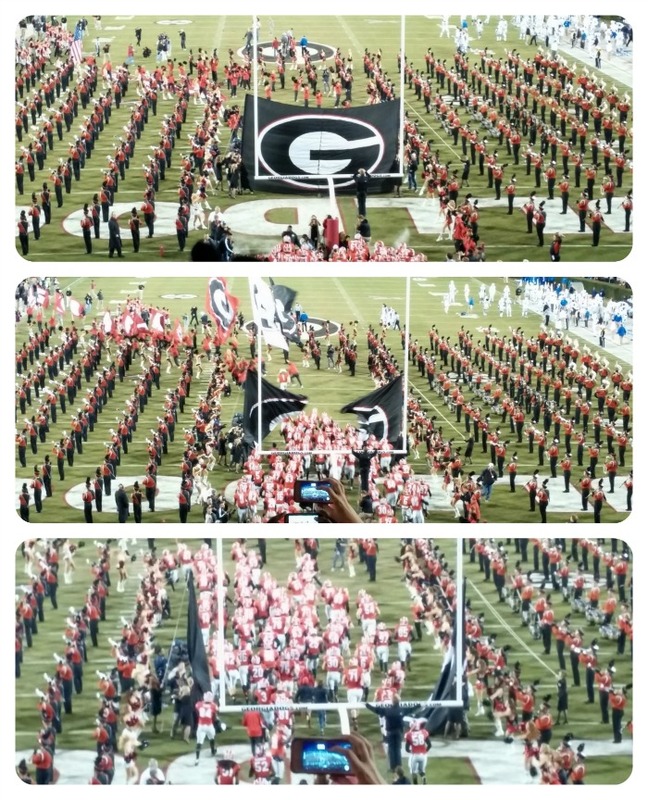 The weekend before Thanksgiving, my son Jake and I drove up to Georgia to see his first UGA Home game. 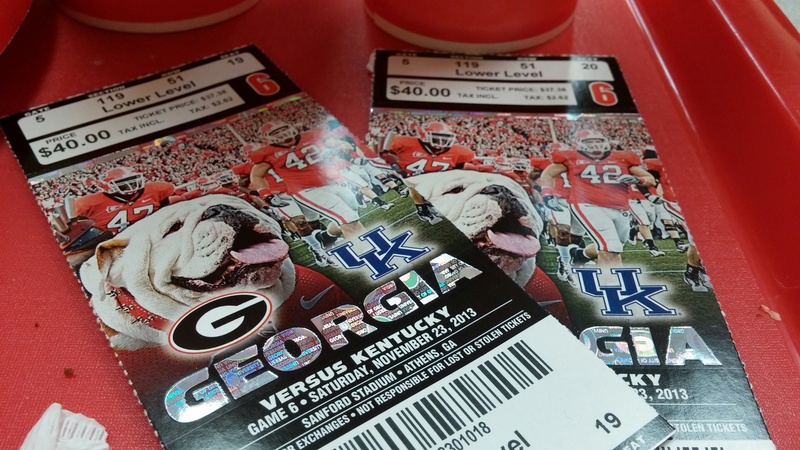 Jake has watched Georgia played dozens of times on TV and in January, he got his first look at a live football game when UGA played in the Capital One Bowl. He’s been bugging me for years to take him to a game and that weekend, the stars were aligned and I figured out a way to make it happen. When I bought the tickets, it was scheduled to be a 1pm game but the week before, they changed the time of the game to 7pm. We decided to drive up early and spend the day in Athens. 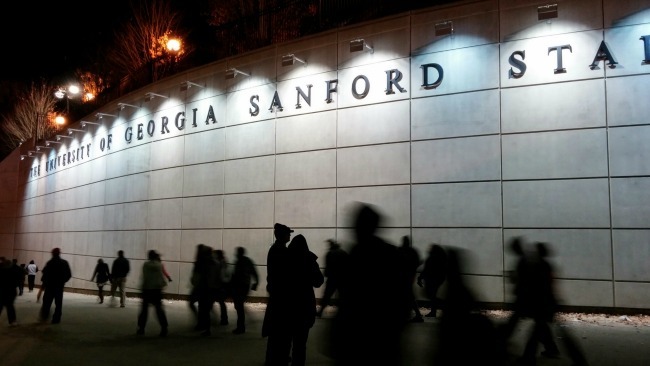 UGA fans were everywhere – tailgating, walking around campus and doing the basic pre-game rituals to eat, drink and be merry. I showed him what we call Greek Row – a street in Athens where most of the sorority and fraternity houses were located. We laughed at the difference between the sorority houses, all decorated with their recently mowed lawns and the frat houses who were hosting their own tailgate parties that spilled out of their homes into their front yards. Then I took my future UGA baseball player (hey, a mom can dream, can’t she?) to see the Georgia baseball field. We pulled up next to a couple of families tailgating by the field entrance and got out to take a look around. Unfortunately, everything was locked up so we couldn’t get in and let Jake run the bases so we started talking to the two moms who came over to see why we pulled up. Ten minutes later, I upgraded our seats from the 3rd level down to the first level with seats smack in the middle of the end zone. I didn’t think this adventure could get any better but that’s what happens when you spend the day in Athens. I started to remember why I loved living in that town. Something happens to you when you’re there on game day. Everyone is friendlier, happier and you can’t wipe the smile off your face. After we drove around a bit more, we ate at one of the oldest restaurants in Athens – The Varsity – and then headed to the game. We parked our car and walked to the stadium. I showed him the dorms where some of the students lived and the buildings where they held classes. I pointed out my sorority house and a couple of places where I lived when I went to school. We got to the stadium, found our seats and settled in. We were thrilled to find out that our seats were right on top of the tunnel – the place where the players run out from the locker room. This was our view when the game started. The game was great and we beat the crap out of Kentucky. I admit, I was a bit concerned. We’ve had such bad year with way too many injuries and I was hoping that Georgia wouldn’t lose for Jake’s first home game. Thankfully, the Dawgs looked like the team that we love and the final score looked more like basketball game instead of football. The only bad thing about that night was the weather. Once the sun went down, the temperature did too. It was cold, I mean really cold like 40 degrees. And no snarky messages from those of you up in the north dealing with that winter storm. Remember, I live in Florida. It’s 80-freaking degrees here this week. My AC is still running so anything lower than 50 is cold to us Floridians. We cheered and yelled when Georgia scored and stopped the other team. But mostly, my son the “Please stop talking and give me 5 minutes of peace” and “Is that another note from your teachers about talking too much?” was speechless. What a wonderful trip! You have made a great memory with you son, and he’ll talk about it for years to come. Good job, Mom! Wow! What a great adventure and wonderful memories were made that day! I love trips like that – they just seem to work out even better than anticipated! After we got the new tickets, I kept saying stuff like, “I love it when a pkan comes together.” Hopefully, I can figure out another trip up there next year, naybe earlier in the year when it won’t be so cold. It sounds like a great experience. As I mentioned on your previous post, there is nothing like a college football game. It was a long day but loads of fun. Totally agree about college football – it’s such a cool experience that I’m glad I finally got to share this with him. Hopefully you can take your boys one day. Who do you think will play FSU for championship? Looks like its going to be Auburn. As much as I don’t like Auburn, I’ll probably cheer for them so we can keep the SEC streak going for the national title. What bowl is your team in? I have never gone to a bowl game. I used to be really into college football and thought it would be so much fun to go to one where PSU is in it. Still wouldn’t mind. We’re in the Gator Bowl in Jax. As much as I despise anything hwving to do with the gators, I’m glad we got a bowl game this year. We had such a crappy year that I wasn’t sure if we would get into anything. I’m just the opposite – I use to be into NFL and now I hardly pay attention except for the Superbowl. Can you take your boys to a NFL game? It’s not easy to get tickets. My younger boy is not so into sports at this point. Also, tickets are very pricey. We’ll get there one day. Two more years off for PSU. That’s how to do it momma!